Structural Insulated Panels (SIPs) join high-performance rigid foam insulation to Oriented Strand Board (OSB). The thickness of foam is adjusted to increase R-Value. The first SIP-type construction was made in 1935 and the buildings are still in use today, nearly 70 years later. A SIP home package includes pre-assembled panels, insulated headers along with window and door cutouts and horizontal and vertical electrical wire chases. Using SIP roof panels, a home can have high vaulted ceilings. Ridge beams with EPS panels can eliminate trusses and open your vaulted great room with extremely high R-values and air-tight panel systems. The engineered fabrication of structural insulated panels allows for flexible design and building options and can accommodate unique and complex home designs. Because the expanded polystyrene foam insulation is solid, SIPs are proven to be up to 15-times more air-tight and can reduce energy consumption by 50% or more. The savings over the life of your home mean you will have a lower cost of home ownership. 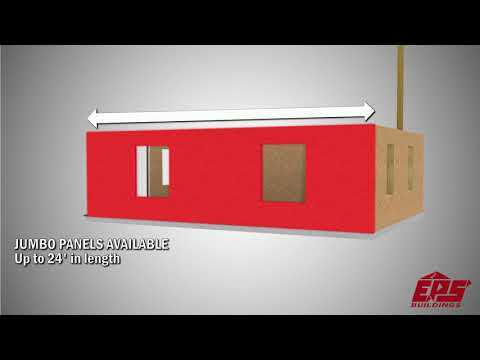 This short video demonstrates how a new home is built using structural insulated panels. See how the panel joints are sealed to lock out air; see how electrical wire chases are included in each panel; and see how windows and doors are fabricated into the panel. Structural insulated panels prevent air from gaining access to the interior of the home except in controlled amounts. A controlled indoor environment is both healthy and comfortable. Controlled ventilation filters out contaminants and allergens and also allows for incoming air to be dehumidified, reducing the possibility of mold growth. Home insulation is rated by the R-Value which is a measurement of the materials’ thermal resistance. The higher the R-Value, the more effective the thermal barrier is between the outside and the inside space of a home. SIPs are solid insulation and maintain their R-Value. Tests show that installation of fiberglass insulation with 2x6 studs is reduced to R13.7 or lower caused by thermal bridging between the 24-inch studs. Impact resistance is another standard feature of a SIP home. The continuous bonding of EPS insulation to the OSB offers incredible strength and resistance to impact. Vertical and horizontal stress loads are tested two times stronger than conventional stud walls. SIP walls resist up to 7,000 pounds per foot which results in structures that are stronger, straighter and wider. Because the panels are delivered as pre-assembled panels, a new home goes together quickly on the job site. Window and door cut-outs are included as are insulated headers. On-site labor is reduced and the house has less chance of being exposed to poor damaging weather conditions.